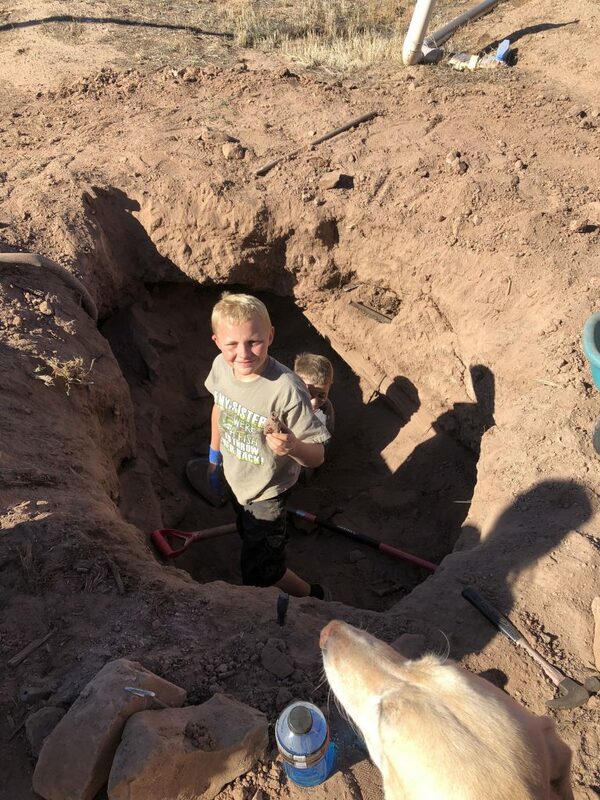 WASHINGTON CITY — Deep in the throes of boyhood adventure, 11-year-old Tyrel and 9-year-old Jack were digging a pit to build an underground fort when they discovered what a local historian believes could be a structure built by early settlers of Washington City. The Hughes brothers were digging next to an old two-story home near the corner of 100 South and 200 East. 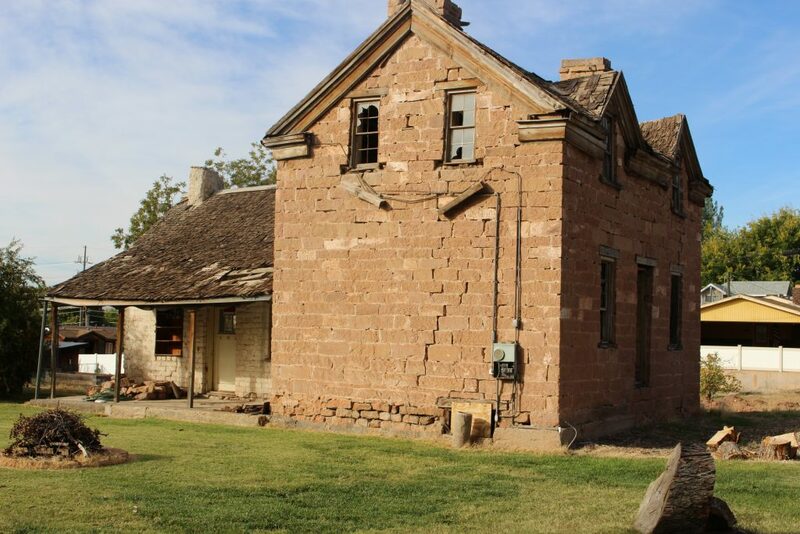 The home was built with sandstone bricks as Washington City was first being settled in the mid-1800s. 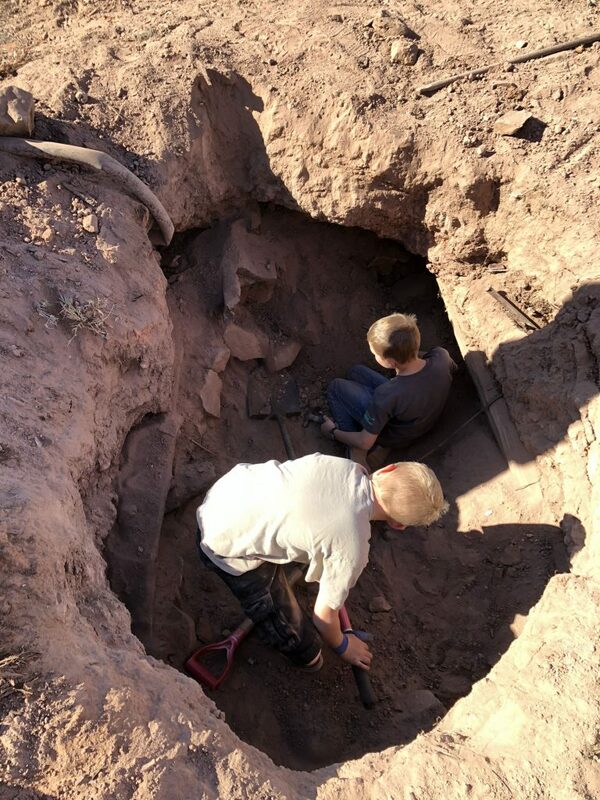 The boys had spent much of their time over their fall break in October and many afternoons since excavating the hole and continuing to burrow deeper in search of more discoveries. They eventually found what they told St. George News they thought was a well. However, Richard Kohler, president of the Washington County Historical Society, said it more likely was a cesspit for an outhouse, but certain aspects of the hole’s construction seem to point to other possibilities as well. The boys started digging the pit in a sunken area of the lot near their home after getting permission from the landowner. They wasted no time using their hands and shovels to dig as deep as they could. “We wanted to find treasures and build a man fort because we can’t dig in our own backyard,” Tyrel said. 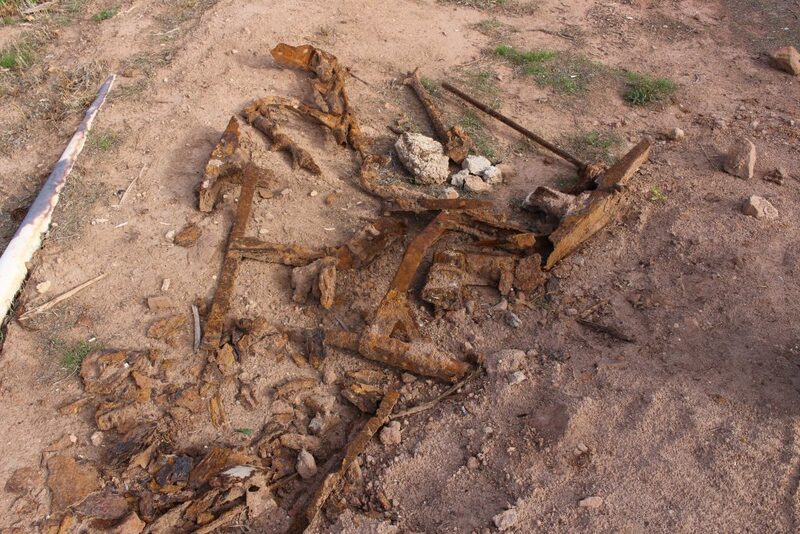 The first things they discovered were rusty metal pieces they thought were parts of an old car or a tractor. As they continued digging deeper, they discovered rocks stacked in a circle around the outside and extending even deeper. 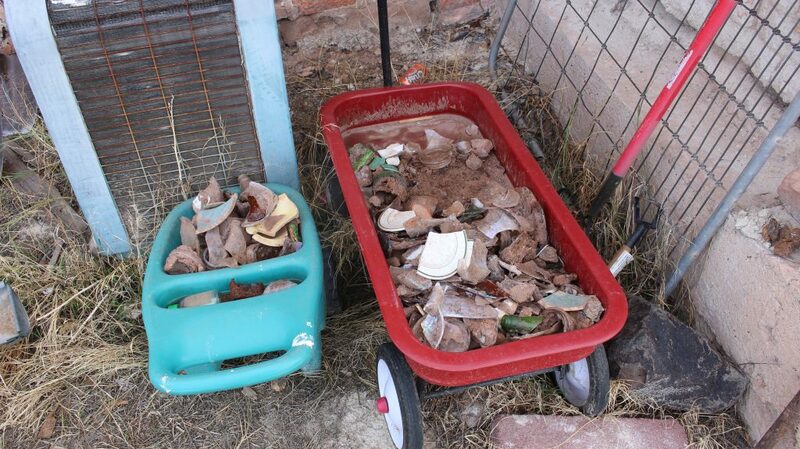 They also started finding dozens of shattered pieces of glass, jars and bottles with their lids rusted shut. “We now think it’s a well,” Tyrel said. 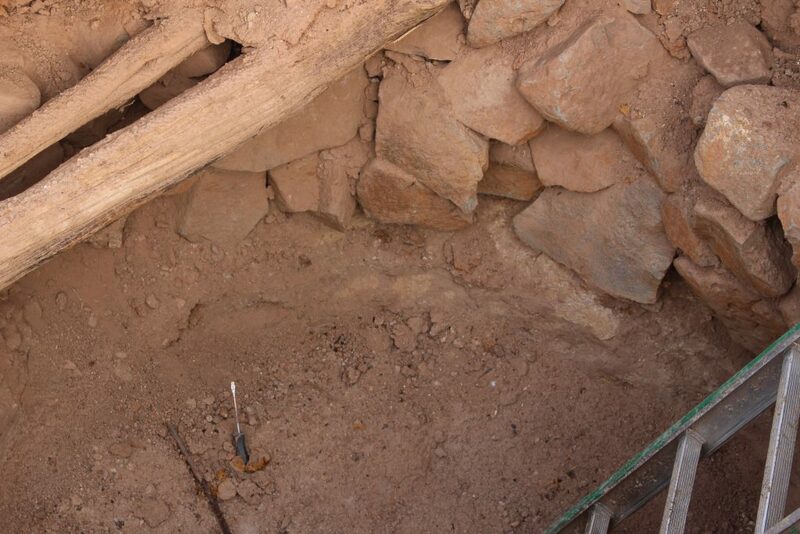 Whoever first dug the pit and placed the stones around the outside bored through a solid sandstone layer in the earth. 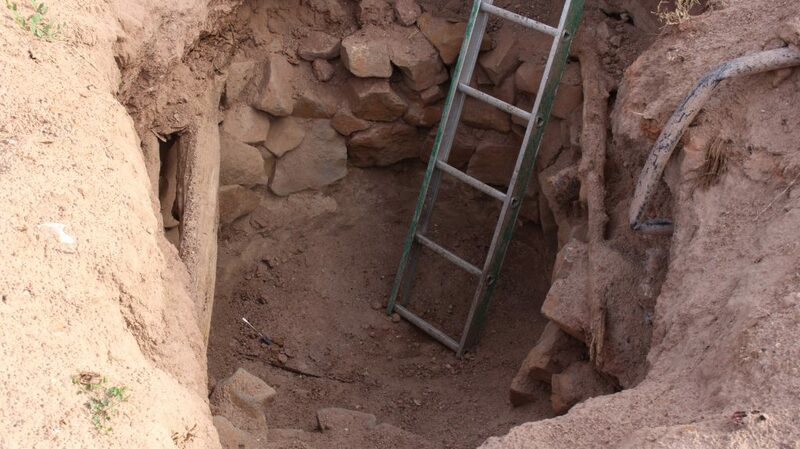 The hole is about 6 feet deep right now, but the original pit seems to keep going down. Lacie Hughes, Tyrel and Jack’s mother, said the boys have run outside and continued their effort digging the hole after coming home from school most days. 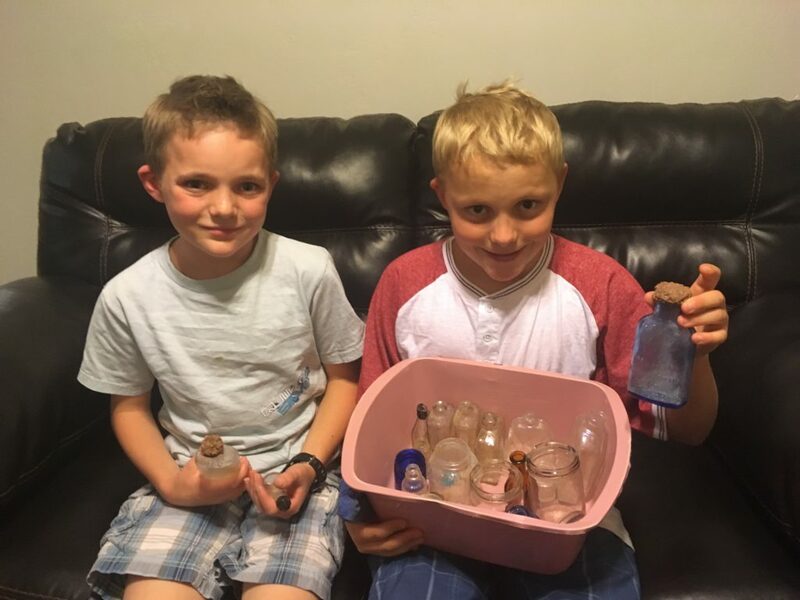 When the boys found the first unbroken glass bottle, Lacie Hughes said they came running into the house to show her the “buried treasure” they found. “It’s been good clean fun for those boys,” she said. 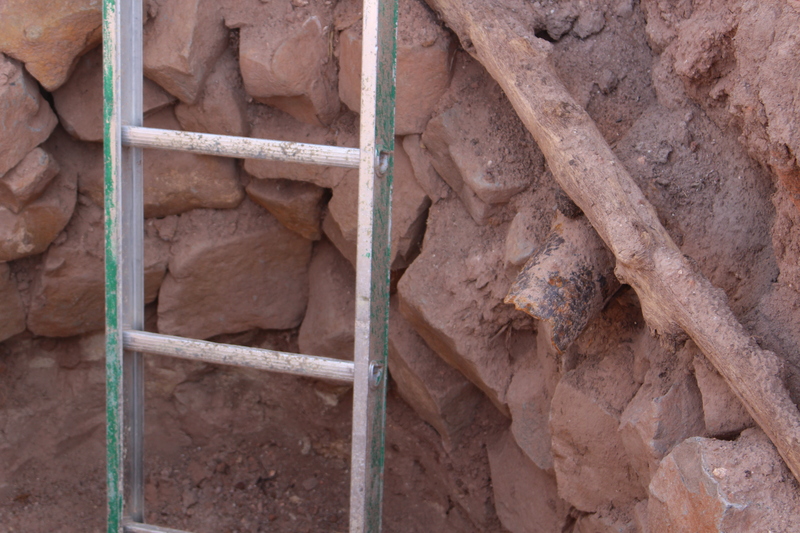 Kohler called the buried structure “a mystery.” One clue comes in the form of an iron pipe, which leads into the pit from the direction of the sandstone house on the lot. Iron pipes were not introduced in Southern Utah until after the 1920s, Kohler said. 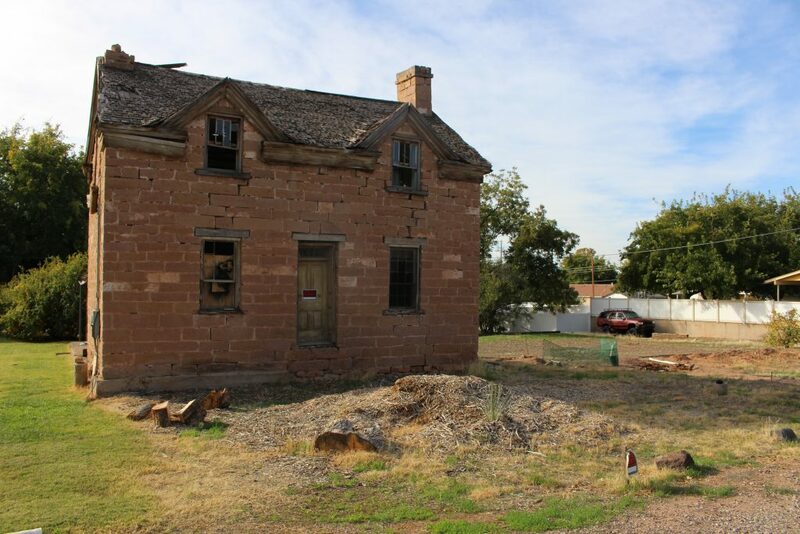 The first pipes and indoor plumbing built in the area was in the Dixie Academy building on Main Street in St. George, which is now the St. George Children’s Museum, he said. “It could have been that this pit was a cesspit for an outhouse in the 1800s, and then over time, when they didn’t need the outhouse and they moved the plumbing outside, they could have added piping to lead into the pit,” Kohler said. If the pit was once a cesspit for an outhouse, Kohler said it was unusual that such care would be used in placing all of the stones to line the pit. Usually, settlers in the area would just dig a dirt pit for an outhouse. Oftentimes, they wouldn’t even construct a pit under an outhouse; they’d just use a bucket that would be dumped after it got full, Kohler said. 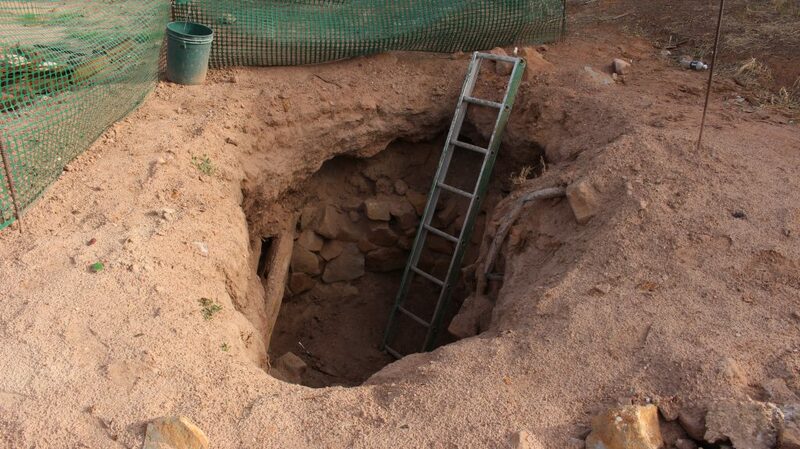 Because the pit goes past the sandstone layer in the ground, it is a possibility that the pit could have been a well at one time, although a well in the area would have also been rare, Kohler said. Ditches brought water from springs to the neighborhood where the home is in Washington City when pioneers first settled the area, so there would be less need for a well to be built, he said. A post written by Harold Cahoon of the Washington City Historical Society on Washington City’s website also mentioned the ditches that ran through the neighborhoods. Once the pit had served it’s purpose – whatever that purpose was – Kohler said it would have likely been filled in with dirt until it was discovered decades later. 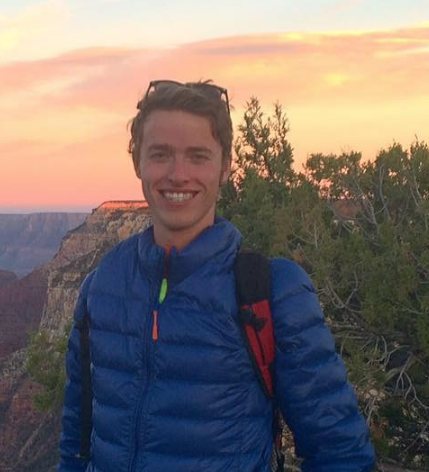 Tyrel and Jack said they are planning to keep digging until they hit rock bottom and won’t stop excavating the site until they find some solid answers. This is dangerous. The hole could cave in and hurt the boys. Please warn the parents of the possibility that the hole may collapse. Let’s see now. An 11 year old and a 9 year old digging in a six foot deep hole. There is broken glass and rusted pieces of metal. There is also the likelihood that they are digging in an old outhouse pit. What could ever go wrong with this? The land owner is obviously not very smart either. Stop being such a prude. Move back to California. How fun for those boys. That’s every kid’s dream come true: playing in dirt and finding treasures. What a great way to spend Fall Break! Oh come on folks, these kids are having fun. The stuff I did as a kid was much more dangerous than digging a little 6′ hole. Guess they should be indoors playing minecraft where it is safe. What a generation of wimps. Maybe you could set up playdates for them. Keep searching for treasure! So two young men , not soy boys, digging into the past and a few people freaking out about it? My goodness they aren’t even wearing protective gear. Life is DANGEROUS.. There are no guarantees so live it to the MAX. Amen. And whatever you do, try to stay out of old 1950s Nike Silos. Lol . And when you get older, avoid cheap Kmart boots when hiking Tiger Leaping gorge in the rain – easy to slip. Look for vibram soles! Nor go caving in Laos in a newly discovered cavern up the Mekong and have a tour guide that smokes cigarettes in the cave and gets lost on the way out. Or for that matter almost get washed out to sea in a Kayak on New Years Eve off the coast of S. Cambodia after the current shifts for the worse. Lol. Cool, kids having fun and exploring! But, I admit, the first thing that came to mind was it was possibly an old Mormon outhouse.